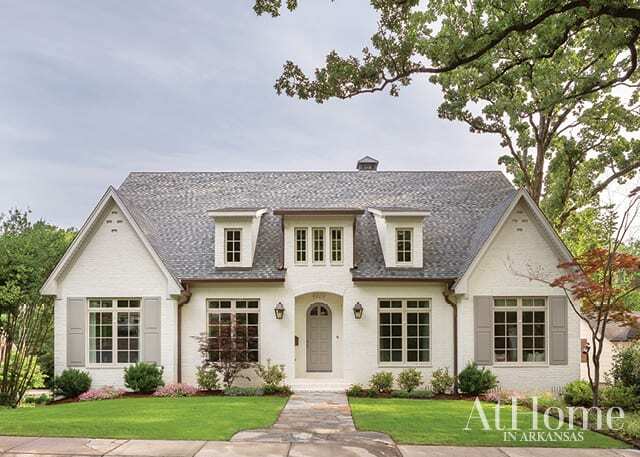 Designer Chandler Bailey started working with a family of five on this new construction home in Little Rock in the very, very early stages of planning—in fact, at the time, a completely different house stood in the lot. “I met with the homeowner with just the contractor’s drawings before they’d even torn down the house yet,” Chandler says. Knowing that they loved the neighborhood but not the house, the family brought in a talented team to help create their dream home from the ground up. Chandler took every opportunity to customize this home to the family’s needs, including adding a screened-in porch accessible from the living room and master bedroom, finding smart solutions for storage, and thinking ahead to how the children will use their spaces as they grow. Other tweaks are small but meaningful. For example, she swapped the cooktop’s location on the island with that of the sink overlooking the windows. “She works at the sink more, and she wanted it to look out into the room where the kids would be,” Chandler explains. Chandler says one of the major challenges that came with this project was in leveling the sloped lot. She and the contractor, Boyce Holmes, moved the home’s footprint closer to the street, which allowed them to level the lot more and also provided space to add a fenced-in backyard where the children can play. 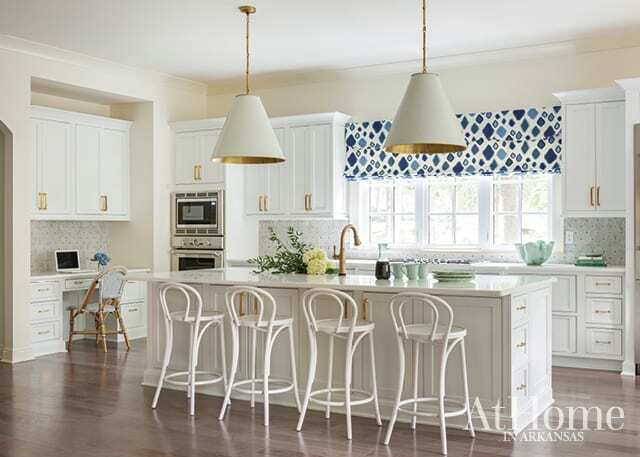 A multi-functional breakfast area—check out that storage under the benches!—is one of the family’s favorite spaces in the house. “Right now, the kids are so young that they don’t use the bar stools at the kitchen island, but those benches get used a lot,” Chandler says. “They think they’re fun to sit on, and they can all fit around the table. 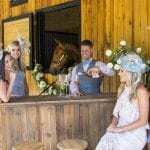 Plus, it’s easy to add a high chair, and we knew the homeowner was pregnant at the time.” The banquette’s table also offers the perfect serving space when the family entertains. 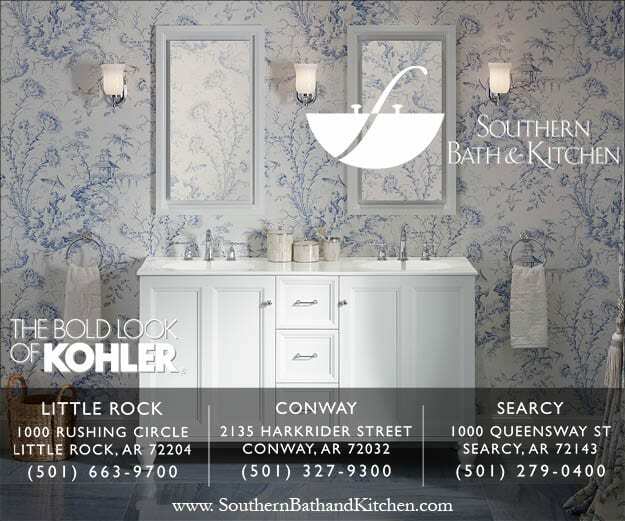 A collection of jade McCarty pottery in the built-ins pays homage to the homeowner’s Mississippi roots. The kitchen overlooks an open living room, so the homeowner can keep an eye on the kids while she preps meals or washes dishes. The fireplace’s tile surround echoes the backsplash in the kitchen, tying the two spaces into one cohesive living area. Chandler incorporated Crypton fabrics and had the furniture fiber-sealed where possible to make the living room extra kid- and dog-friendly. 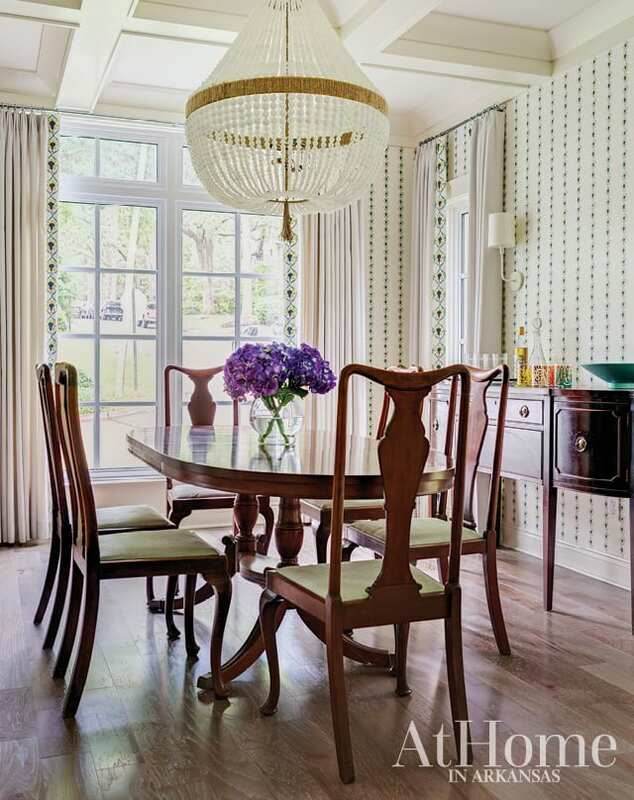 The formal dining room displays the antiques collected from the homeowners’ parents and grandparents, while a coffered ceiling, statement chandelier, and Mally Skok wallpaper and trim on the drapes modernize the space. 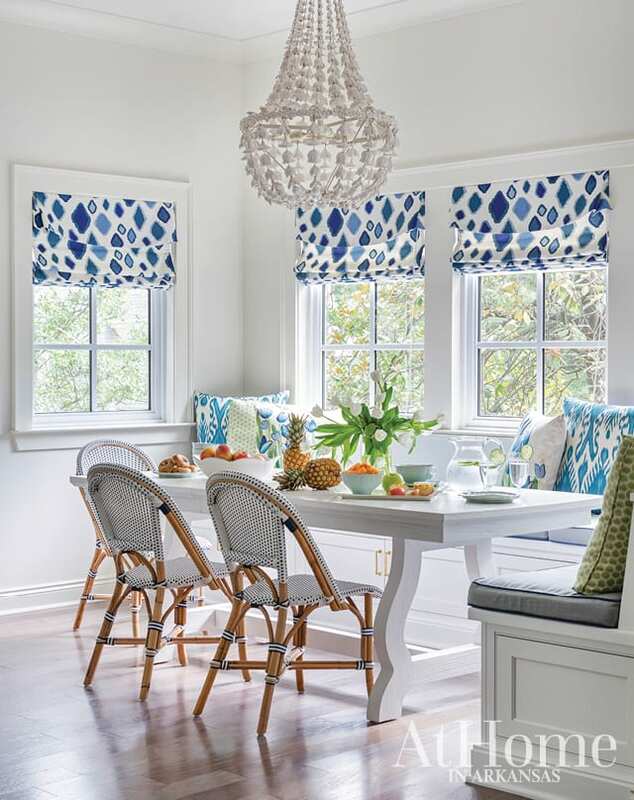 Though the family more often dines in the breakfast nook, this room is perfect for special occasions and holidays. 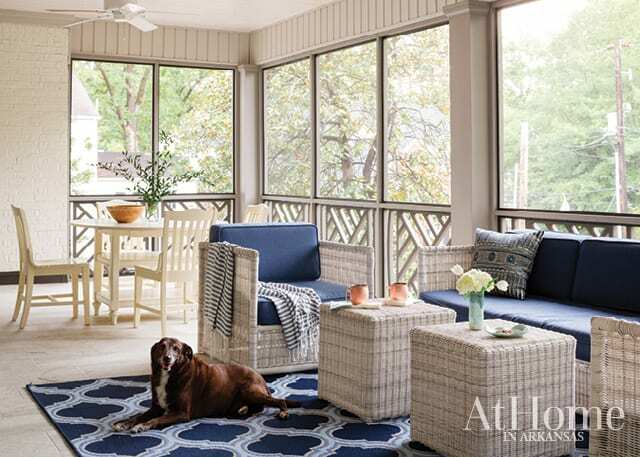 French doors in the living room lead to a second-level screened-in porch, another one of the family’s favorite gathering areas. 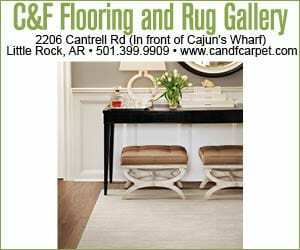 “When the weather is nice, this is their go-to spot,” Chandler says. The interior’s cool colors and cozy textures continue into this space, which makes it a natural extension of the living room when the doors are open and the family is hosting friends. 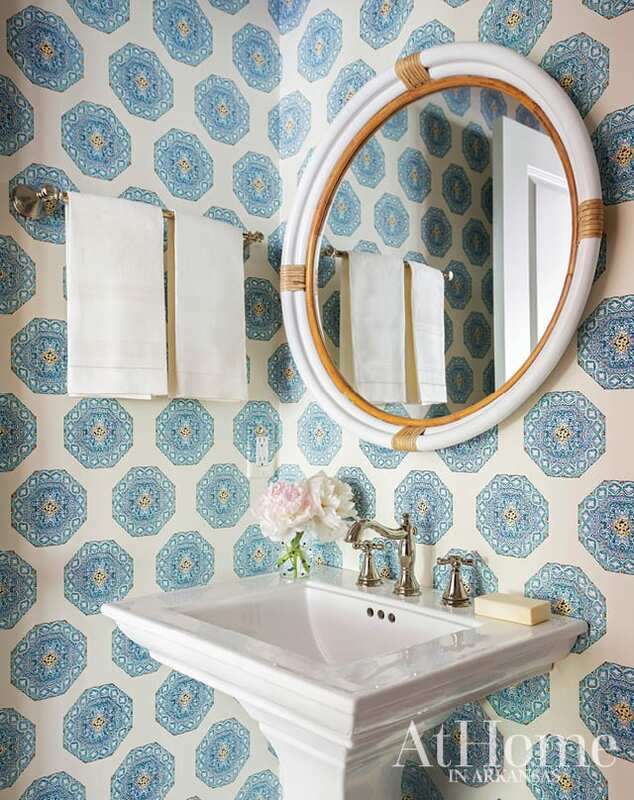 The walls of this cheery powder bath are covered in Quadrille’s “Medallion” wallpaper. A Serena & Lily mirror echoes the home’s slightly coastal vibe. An abstract painting by Ashley Saer adheres to the palette while bringing a contemporary flair to the master bedroom, a restful retreat for two busy parents. While the nursery’s crib and changing table are repurposed from big sister and brother’s nurseries, the family’s newest addition had his room personalized with new linens, art by Ashley Saer, and a teepee perfect for tummy time and hide-and-seek with siblings.